"Gift for Christmas showing enduring love"
Swans are forever faithful to their partners and just look at our beautiful rivers around our country and you will often see these magical swans moving gently and caring for each other! 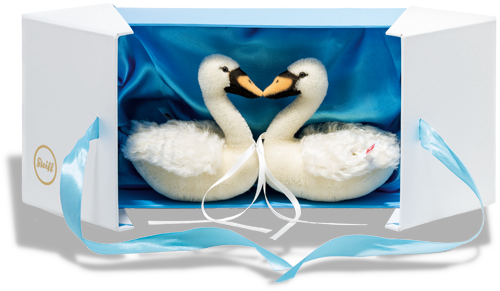 With these superb Steiff Swans you can express a gift of such love. They are made from the finest white mohair and arrive sitting opposite each other in a beautiful gift box lined with water blue satin. The fluffy gentle dress on their back adds to their realism and the hand coloured neck and beak of the swans join and form a HEART shape - such love! Look carefully and you will see that each swan has been made with two satin ribbons on their front. These can be used to attach rings, precious jewellery, words of love - actually any item of love. This can be a present for the one you love or a couple very dear to you! Only the worldwide famous Steiff make such desired gifts of design and more importantly - love! Swans do not have ears so Steiff have attached their famous button in the ear into their gentle wings. Apologies but this special Steiff Limited piece is just too large to send abroad with free postage. If you do want to send this piece abroad please contact us and we will inform you about the delivery and cost required. Surface washable.